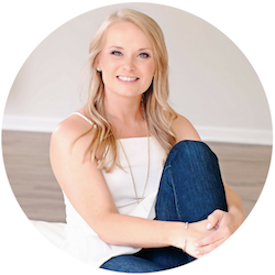 Many months ago I shared my inspiration boards for nurseries of both genders (girl, boy). 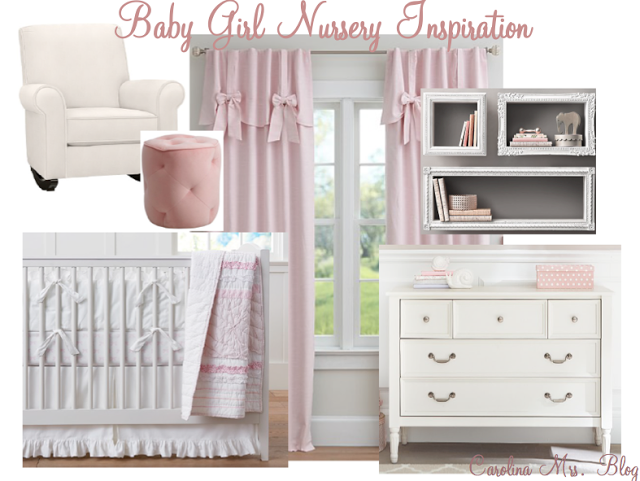 Then, we announced Baby W was a little girl and we moved along with creating a nursery similar to what I envisioned. 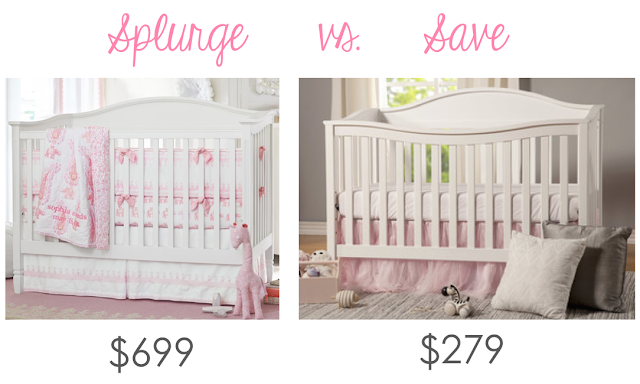 I ended up making some very economical choices for furniture compared to what I highlighted in my dream nursery and I love my choices so much. Let's play a little "splurge vs. save, buy this, not that" before we see the finished product. I wanted the Madison crib from Pottery Barn. I loved that it was convertible. Simplistic yet had some great details. Look at those feet. What I actually bought was he DaVinci Laurel crib courtesy of Wayfair. The feet are the same but the front doesn't have quite the same level of detail. All the baby stores and big online stores have it but Wayfair was least expensive and shipped it free. It even got a tiny scratch during shipping and they promptly replaced the piece no questions asked so that the nursery would be perfect. 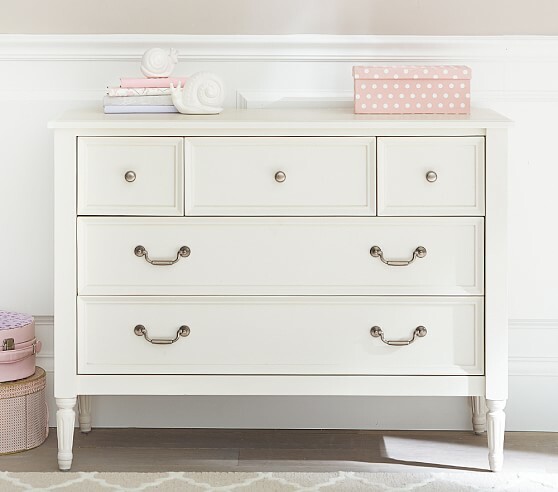 For a dresser and changing table, I started out really loving the Blythe dresser from Pottery Barn, pictured above. Once I decided I wanted to do true white instead of antique white in the nursery, I ended up loving the Ava Regency dresser. It was a little bit too big and way too expensive once I factored in the uncharge for large furniture delivery. 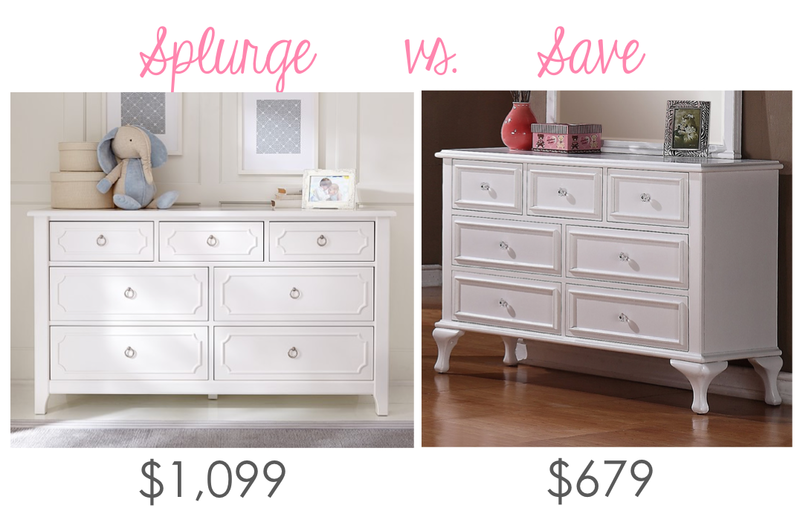 I ended up going with the Jeslyn dresser, which I found on Overstock. This turned out to be such a great purchase. Not only is it beautiful and I love it but it shipped for free with room-of-choice delivery and set-up. For Madeline's glider, I really, truly loved the Charleston glider once again from Pottery Barn kids. Having seen it in person in the store and priced it out online in my fabric choice, I don't think its altogether unreasonable for the quality. However, knowing that I will only use this for two years or so then maybe, if we are fortunate enough to have a second child, another two years in a different nursery, it just didn't seem practical. It is a beautiful chair, though. I ended up going with the Delta Children's Avery glider. It is available all over the internet but I ordered it from Target for a couple reasons. The sand color was least expensive there and it qualified for free in-store returns. Since I didn't get to sit in this one before purchasing, I was nervous about ordering it sight-unseen because paying to ship back a glider would have been costly. Lugging it in a friend's pick-up truck back to Target on the other hand would have been totally do-able. There weren't any reviews on target.com when I ordered but all of the ones I read on other sites were very favorable and we are happy with it. 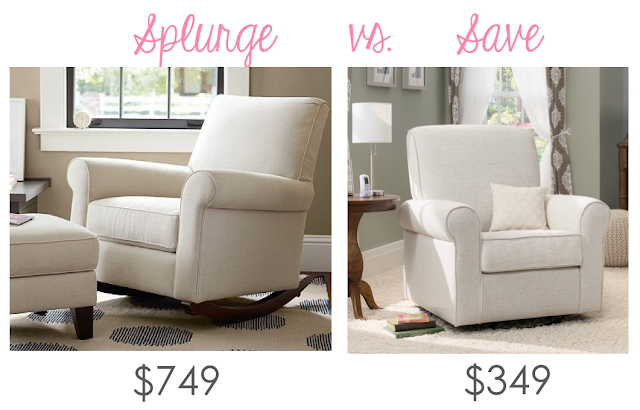 With all of these savings on furniture, don't worry. I made a few splurges as well. I purchased the bow curtains from my inspiration board as well as these wall shelves, the pink posh pouf to use as an ottoman, and the Bridgette quilted bedding. I definitely think with pieces like a crib, that you won't keep forever, you should save as much as you can! Great round up! Why you should never, ever build a house.